Give and nature will return ten fold. 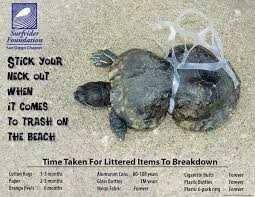 Trash on the beach and in the ocean is deadly to the beautiful creatures that live there. Like bids for instance will eat trash and end up choking on it. Some trash sits there and starts to break down and have nasty toxins in it that the waves bring into the ocean. This will make the ocean and its creatures unclean could up imagine biting into fish and it taste like how we treat them because that will eventually will happen. We as the human race need to pick up after ourselves in what ever we do. We need to have trash pick up parties or we could give the people in jail some thing to do. If the government paid people to pick up trash thought the city they see or on the beach then their would be a cleaner city / beach.